Welcome to The Spine Group! 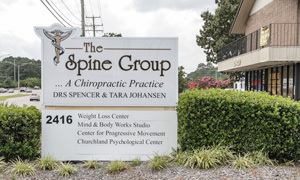 Dr. Spencer Johansen and Dr. Tara Johansen opened The Spine Group over 20 years ago and pride themselves on listening and providing information to help you make an educated decision with regards to your health. Drs. Johansen believe in restoring their patients to optimal health in as short a period of time as possible through exercise, nutrition, and awareness of existing problems. Combined with convenient office hours and specific gentle adjusting, the doctors offer personal and compassionate care. Our mission is to help our patients achieve optimal health so they can enjoy life. We’ll help you to feel great and be able to do the things you want to do. We are a family practice and work on people of all ages, from newborns to those well into their 90’s. You don’t have to let pain limit your life. Don’t be held back from doing the things you enjoy. Chiropractic care can help you live your life to the fullest. Chiropractic adds life to your life! The Mind and Body Works studio, ran by the doctors and located in our building, offers massage therapy, stretching classes, yoga classes, foam roller classes, life improvement seminars and other wellness-based meetings. We welcome you to see which classes are coming up and encourage you to join us! No matter what your needs are, we want to support you.